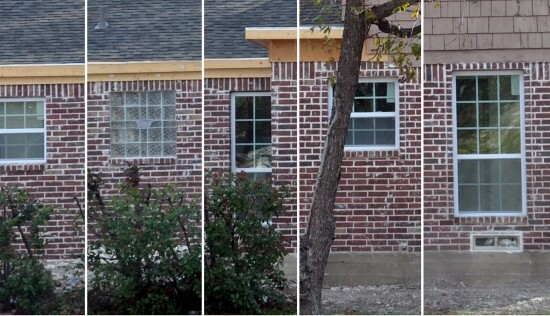 Back in December of last year I twisted off on a house that I drive by a few times a week – just amazed at how sloppy I thought the work was. This was a first for me, I had never identified a house and singled it out for being less than it should be. The title of the post was “This make my face hurt” and I was surprised by the response I received. People who had never left comments or emailed me came out of the shadowland and filled my inbox with comments. As it turns out, I hit a nerve and the comments were all regarding how funny the post was and how terrible the house was – two topics made perfect for one another in blog heaven. And speaking of Heaven, it’s time to revisit that sad house. It’s been almost 7 months and there has been a little progress. It hasn’t been good progress either. This is the house in question. There are so many things wrong here it literally make my face hurt. 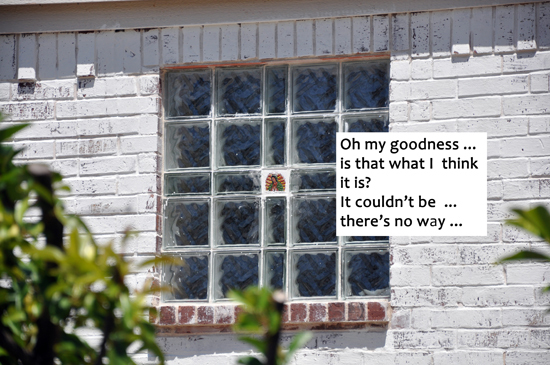 Yes, I covered the material transition from brick to stone at the corner … mgraaargh – (swallowing) sorry about that. That’s nasty – we can all agree on that. But the real focus of the post was on the side elevation and the vast array of different windows types, patterns and installation heights. Yikes! There are 5 windows and 4 of them are different. To make the comparison a little easier to visualize, I’ve assembled them side by side. So … I’ve waited this one out and they have come up with a solution. When I drove by and saw what they had done I nearly rear-ended the car in front of me. So how did they solve that nasty problem with the center duct tape spot? Let’s take a look shall we? Is that … caulk? (somebody get me a bucket please). Could it be any whiter? Could it be installed level? Could they get caulk all over everything? This is wrong on soooooooooo many levels that I am about to explode. I am so, so very happy that this happened but for all the wrong reasons. How do you think this came to be? What was the conversation? Did they go get this tile special or was it already in the truck leftover from another job. Is it sacrilegious to repurpose the Virgin Mother? 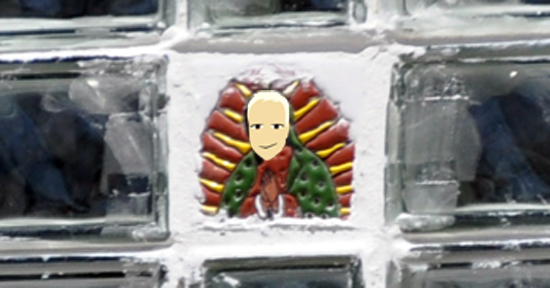 Worker #1: So I guess we should have thought this glass block pattern through a little bit better huh? Worker #2: I guess. So what now? Do you think we can leave the duct tape in. Worker #1: NO! We can’t leave the duct tape in place – pretty sure someone would notice that. There must be something we could fill it with….? Worker #2: It’s really like a super fat joint …. maybe we could caulk it? Maybe get all sorts of extra caulk all over the glass block joints? Worker #1: That’s not a bad idea! But,I don’t know. You think that would be noticeable, maybe it wouldn’t look so good? Worker #1: Yeah, I get your point. Maybe we could stick something decorative into the caulk – make it look like we did this on purpose. What do you have in the truck? Worker #2: I have some tile leftover from that back splash job. 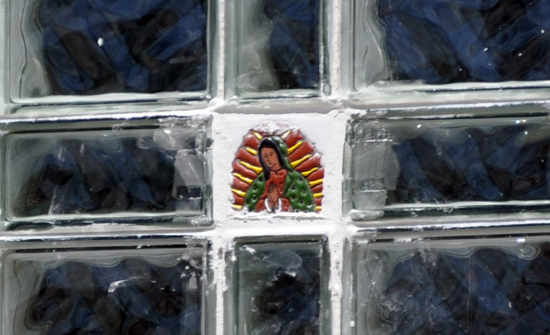 We had an extra Virgin Mary tile left over, it seemed weird to have more than one Virgin Mary tile in the back splash so we didn’t use it. Worker #1: Yeah, I suppose you’re right. Besides, who is going to criticize the Virgin Mother? Cheers, thanks for reading Life of an Architect, please pray for me, I think I may need it.